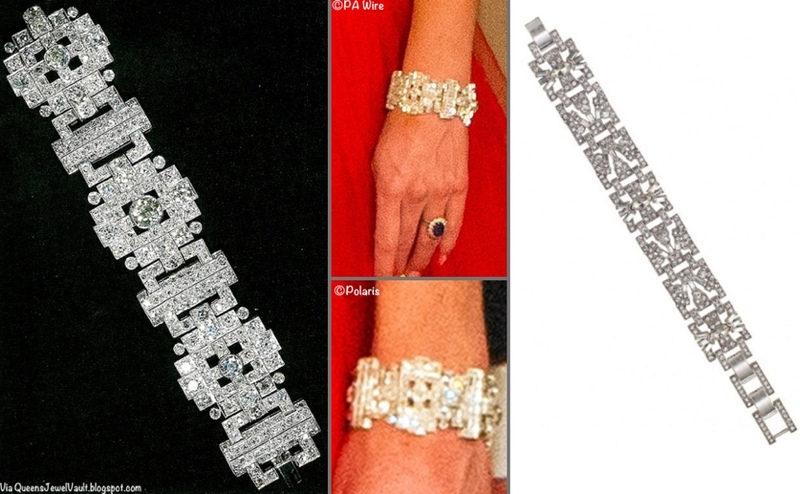 OCT 6: A few options for to repliKate the wide diamond bracelet Kate wears. To the immediate ri of the Kate photo, the Anne Klein Crystal Stretch Cuff ($34.50) as shown at Macy’s. (It’s also available at Lord & Taylor for $36.80 with promo code COLUMBUS.) Next, another Anne Klein piece, the Silver Tone Crystal Cuff ($28.50) at Macy’s. On the far right, Elequeen’s Austrian Crystal Party Cuff ($86.99); we show it at Amazon. MAR 6: For the ‘Wedding Gift Bracelet’ worn at the China State Dinner, this is the ‘Casablanca’ bracelet by Stella and Dot, $79. Our thanks to Betty C for the tip on this one!